This year the Pulitzer Prizes celebrate their centennial. I was a finalist in Public Service in 1998, was part of a group win in Breaking News for Earthquake coverage in 1995 and won again in 2003 in Feature Writing. 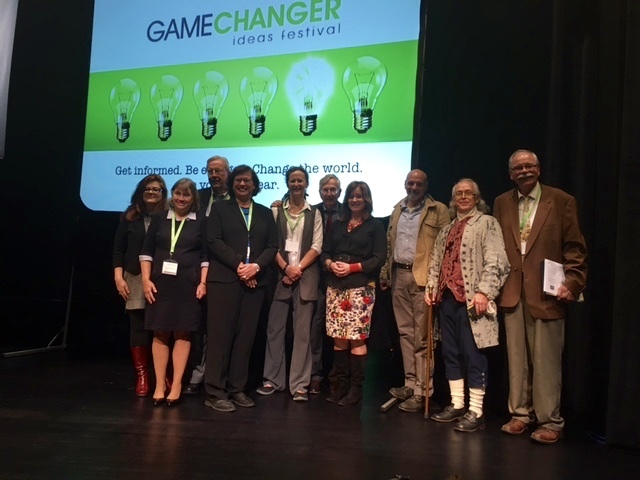 I had the honor and privilege to be a part of the Game Changer Idea Festival in North Dakota where other Pulitzer winners shared their ideas and stories. Some included Seymour Hersh (My Lai, The Killing of Osama Bin Laden), Eric Schlosser (Fast Food Nation, Command & Control), Jacqueline Jones (The Myth of Race), Elizabeth Fenn (History of ND’s Mandan Indians) and Benjamin Franklin. From left to right: Michelle Phillips, Jacqueline Jones, Murray Sagsvenn, Sonia Nazario, Elizabeth Fenn, Seymour Harsh, Monica Hannan, Eric Schlosser, Benjamin Franklin, Mike Jacobs.